Motor Vehicle Accidents Are A Leading Cause Of Serious Injury. We Can Help You Secure The Compensation You Deserve. Construction Site Injuries Can Have A Lasting Impact On Your Quality Of Life. We Can Help You Pursue The Full Benefits And Compensation You Need To Recover. Medical Malpractice Cases Are Often Very Complex. Our Attorneys’ Skill And Experience Can Help You Secure Full Compensation For Your Injuries. If You Know Or Suspect A Loved One Is Not Being Cared For Properly, We Can Help You Protect Them And Create Accountability. When you or someone you love has been injured, it is often overwhelming. Between securing the appropriate medical care and the emotions of seeing someone you love injured, it can be difficult to focus on anything else. It is important to begin taking action as soon as possible to protect your right to compensation. The strongest step you can take to ensure that you are properly compensated for your injuries is to secure the representation of a skilled and experienced personal injury attorney. Our attorneys begin building the case that you need while giving you the time and space to focus on healing. The sooner an attorney begins gathering evidence and constructing a case, the better your chances of maximizing your compensation. At Trapp & Geller, our attorneys have more than 30 years of experience in representing our clients that have been injured in any type of accident. The attorneys at Trapp & Geller have a proven track record of success in handling catastrophic injury cases, wrongful death cases, premises liability, medical malpractice, auto accidents and any case that causes life altering injuries to our clients. We have earned hundreds of millions of dollars on behalf of clients and their families who have been affected. Our award-winning team of attorneys make certain that you receive maximum compensation for your injuries. Through our dedication and zealous representation of our clients and excellent results, Trapp & Geller has been recognized for the services provided. 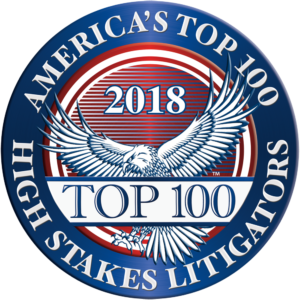 In 2018, Jeremy Geller was named Lifetime Achievement selection among America’s Top 100 Attorneys®. In 2016, Martindale-Hubbell recognized Jamie Trapp for 35 Years of Serving the Community. In 2013, Jamie M. Trapp was named by the Chicago Tribune as one of the leading personal injury attorneys in Illinois. In 2014, Jeremy L. Geller was named by Chicago Magazine as an Illinois Super Lawyers Rising Star – a distinction based on peer review, which is limited to only 2.5% of attorneys in the State of Illinois. Since 2005, Chicago Magazine has listed Jamie M. Trapp in Illinois Super Lawyers – a distinction based on peer review, acknowledging him as among the top personal injury attorneys in Cook County and Illinois. Trapp & Geller has been awarded an AV Preeminent rating by Martindale-Hubbell, the leading law directory in the United States. This is the highest ranking an attorney can receive for ethics and professionalism. In 2012 and 2013, the firm settled numerous million-dollar cases including a $12 million settlement on behalf of a newborn in a medical malpractice case, a $3.75 million settlement for a worker at a construction site who was struck by a falling pole, a $1.25 million settlement for a construction worker injured after falling at a work site, and a $1 million settlement for a railroad worker injured at a Chicago rail yard. Our cases have been featured on television and in newspapers: WGN, NBC, CBS and ABC and in the Chicago Tribune, Chicago Sun-Times and Chicago Lawyer, as well as numerous national law-related journals. Over a 30-year history, the firm has obtained hundreds of millions on behalf of our clients for their injuries. Being injured in an accident can be the beginning of a nightmare. Do not face it alone. Our attorneys help secure the compensation you deserve. Schedule a free initial consultation with one of our Chicago personal injury attorneys.